Quietly announced this morning, the people at the SFMTA announced the upcoming end of sales of Muni 10-ride ticket books sold for Clipper cards. The sales will end starting on January 1, 2014 and any person who has in possession a 10-ride on their card must use them no later than July 1, 2014. Why are the 10-ride ticket books going to extinction? It's elementary, Watson; you see, the 10-ride books was not sold at a discount, so it's the equivalent as paying in cash or Clipper e-cash. 10 ride books costs $20, but the regular adult Muni fare is $2 a piece, so the ten-ride book basically dug itself its own grave. Back in the 'good old days' of Muni, they sold tokens in bags of ten. The little coins was sold in bulks of ten so passengers can save 25 cents per ride. It wasn't until 2005 when a fare hike from $1.25 adult cash fare went up to $1.50 caused the little coin's demise. Since the regular cash fare and passes was going up, people wanted a fare product that was resistant to the hikes, and that was the Muni token. People decided to hoard them by buying as much as they can, that Muni was starting to run short of the coins, had to limit customers to how many bags they could buy, and decided to not produce more coins because it costs more to produce them. 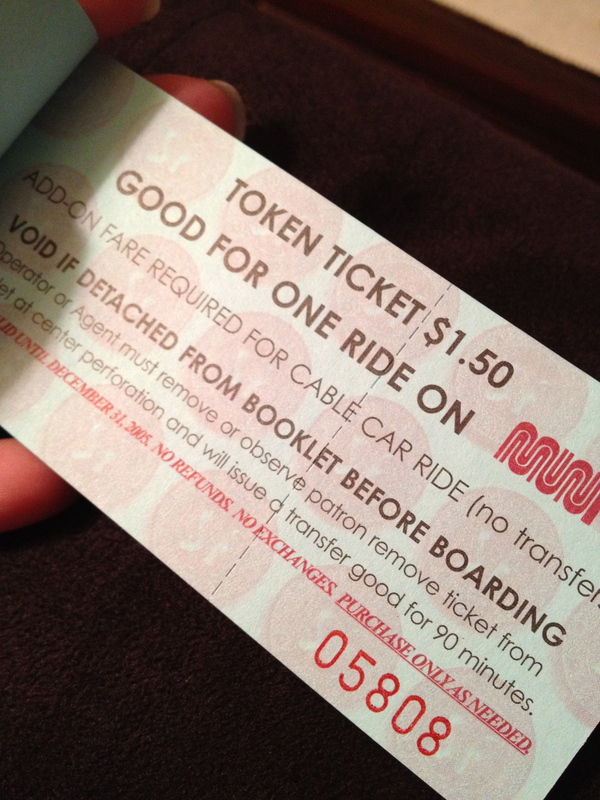 Muni transitioned during that time from actual metal tokens to paper token tickets to meet demand. But with a new policy of no discounts, people who decided to buy them had to spend $15 for a 10-ride ticket book; this meant a very small population of San Franciscans and commuters could use the ticket books because of programs like Commuter Check which had to be spent on physical transit media, like the 10-ride books. This program continued for a long time until the Clipper card came to life. Strangely, when the Clipper card debut and the new Muni metro station ticket machines opened-up, Muni stopped selling the actual paper 10-ride tickets in favor of having passengers load them onto Clipper cards. But since there were no discounts for buying in bulk, the demise of the 10-rides was going down the drain even more. People who used commuter benefits programs are now able to transfer their benefit funds into Clipper e-cash funds that was universal money good on many transit agencies. Basically, with Muni's decision to not provide bulk discounts for buying transit rides in advance is the primary reason in my opinion that the ten-ride books are finally being executed by a firing squad. If you want to learn more about the history of Muni tokens and it's eventual death, read a past blog entry I wrote three years ago. Akit's Opinions & The Future? I think it's fine for Muni to finally end the 10-ride books. The end of the books means that the Clipper card sales options will be one less, therefore simplifying the already complex Clipper card program crammed with various types of passes, transfer rules, and many other transit agency policies. But how about Muni taking on the lead like AC Transit by offering passengers paying e-cash with Clipper to get a discount? AC Transit proposed to passengers that if you pay with Clipper, you will save 10 cents from the adult fare, so instead of feeding a cash box $2.10, you just pay $2 with Clipper. Muni should provide this carrot on a stick to encourage passengers to use Clipper to reduce delays because of passengers paying in cash. Photo of Muni ticket book by Flickr user: cbcastro using a Creative Commons License. 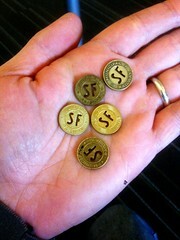 Photo of Muni tokens in hand by Flickr user: joe.moore using a Creative Commons License. A Clipper discount or cash surcharge makes so much common sense. Remember when Muni tried to tack on an extra $0.25 fee for the single-ride "temporary use" refillable Clipper paper ticket and everyone revolted? Now that more people are using Clipper, perhaps it's time to reconsider. This is the best proposal I've ever since. There wasn't anything about Bart-to-bus transfer, I'm assuming that is eliminated also? Seriously, it's easy to obtain a Clipper card now, but most local riders still pay with cash. However, it is still a good idea to have paper day pass. Unlike LA Metro, even buying a day pass requires their TAP card. Tony: BART to Bus transfers still exist and I haven't heard of any proposed plans to end this very long term relationship. I still have a metal (brass?) token. I've been tempted to use it as fare, but it's such a cool artifact.